One of the most difficult aspects of taking blood is finding an adequate blood vessel. Some patients veins are very small and / or deep and prevent healthcare professionals from finding it quickly and easily. Repeated needle are painful for patients. 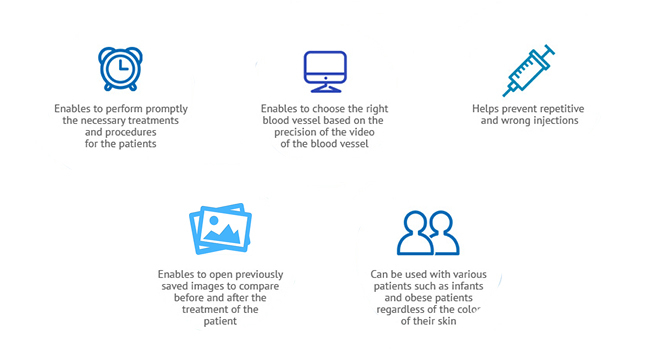 SIFVEIN-1.8 allows health care workers to better see veins. SIFVEIN-1.8 is a portable medical vein viewer is designed for venipuncture. SIFVEIN-1.8 can be used widely in hospital, pediatric clinic, emergency room, outpatient clinic/ center, clinical laboratory, blood bank/ center, military medics unit, the CDC, rehabilitation center, nursing homes and others. First, the hemoglobin in the blood absorbs the infrared light, so there is a reduced amount of light reflection from the veins. Then, SIFVEIN-1.8 provides a custom detection system that uses this change in reflection to determine vein location and pattern, which it digitally projects on the surface of the skin. Lastly, the red laser of SIFVEIN-1.8 makes the vein mapping visible to the clinician. Rechargeable battery, more than 4 hours of continuous work.